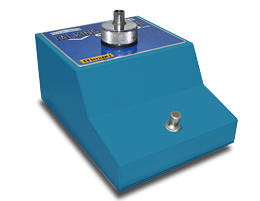 VOC TM-505 is a genuine made-in-Japan talkbox targeted mainly for guitarists and was produced in the 70s by Maxon (Nisshin Onpa Co. Ltd.), a famous stomp box producer. It was called VOC TM-776 outside of Japan and distributed under Ibanez brand. It is also known as a favorite tool of Yoichiro Kakizaki, one of the most famous professional talkboxers in Japan, with more than 30 years of career. VOC TM-505 is carefully designed to the smallest detail. A special woven material with synthetic fibers is used for the three-layer tube, avoiding any distracting bends while playing. The sound is very similar to the outcome of Electro Harmonix Golden Throat; thanks to the sublime Maxon compression driver, the sound is true to the original through low to high frequency. It is characterized by the excellent sound quality in high range, with exceptionally few peaks. It is no longer manufactured, but because of its unique retro design it is still very popular among talkbox enthusiasts, which makes it extremely difficult to acquire this piece.